Data visualisation has become one of the most common modes of information communication because it allows the data or/and analysis of large amount of data to be presented in a good looking and easily understandable way. 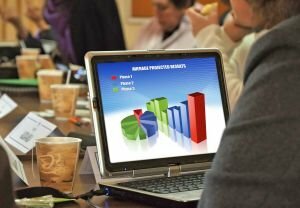 The use of graphs, charts, maps and other visualisation tools has been shown as one of the most effective ways to communicate information as it enables the target audience to “read” the information at a glance. To create data visualisations, various software programmes are used. These are usually designed to meet the needs of specific users. Some of the most popular data visualisation software programmes include Data Desk (statistical analysis), Dundas Data Visualisation, ELKI (data mining), Eye-Sys (interactive data visualisation), Trendalyzer (statistical analysis), GGobi (statistical analysis), ggplot2 (programming language), IBM OpenDX (scientific data visualisation), IDL (programming language), Spotfire (business intelligence), Tableau Software (business intelligence), TinkerPlots (exploratory data analysis intended for students) and many others which are either open source or proprietary. Most data visualisation software programmes are designed with their target audience in mind which means that they usually offer all the tools needed by the specific type of users. Data visualisation software designers typically also pay a great deal attention to ease of usability, printing and extra features which facilitate data management, mining, processing and analysis as well as save a great deal of time for the mentioned processes. However, the difference between one software programme to another can be significant even if both are designed for the same target users. For that reason data visualisation software should be chosen very carefully. As already mentioned earlier, data visualisation software programmes can either be open source or proprietary. Open source programmes are tempting because they are available for free but are they inferior to the chargeable ones? Not necessarily but it depends greatly on what type of software programme you need as some niches such as business intelligence for instance are difficult to find for free. Quality free programming language and scientific software programmes, on the other hand, are found a lot easier. But rather than focusing on the price, you are recommended to focus on features the programme offers because it must meet you specific needs to be able to fully take advantage of it. To make the best choice possible, take time for research on the type of data visualisation software programme you need. Make a list of programmes which are popular among other users and then compare different programmes and their functions. But do not make up your mind just yet because it is very difficult to choose a programme without testing it first. Fortunately, most types of software programmes which are proprietary offer free demos or free trial period enabling you to determine whether the programme really meets you needs. Only when you find two or multiple software programmes that meet you specific requirements, compare the prices if they are proprietary.